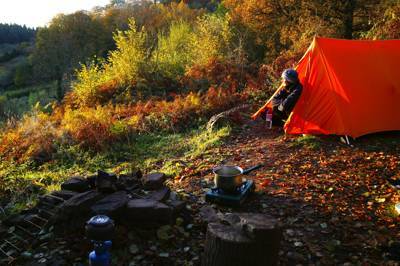 It’s a camping formality that when the weather gets cold you start taking every rug, blanket and sleeping bag you can get your hands on, but it’s not always wise to pile everything over the top. Don’t underestimate just how much heat is lost through the ground. The cold earth absorbs your heat during the night and a good roll matt is essential. Moreover, if you’ve taken a thick pile of blankets and you find yourself getting cold, remember the counter intuitive: pull a blanket over the top of you, yes, but also put some extra layers underneath. Most sleeping bags work by trapping pockets of air that absorb heat from your body and then keep you well insulated. To achieve the maximum insulation, therefore, give your bag a good shake before you use it to make sure it's lofty and full of air. With light bags, shake it from the bottom end to encourage the filling to accumulate in the upper sections of the bag where the insulation is most needed. Don't fill your sleeping bag with too many of your belongings either. Its may seem a bright idea to stick all your clothes inside overnight to keep them warm and dry, but if you have too much it can compress the bag lining and lessen the effect of the insulation. It’s a natural chain of events: First you tuck your shoulders inside the sleeping bag, then your head, and then you begin retreating down inside until your bundled at the bottom. To get the most from your bag though, keep your face in the open. By enclosing yourself within, the moisture in your breath will begin condensing inside your sleeping bag, making it damp and ruining its insulating effect. Keep your mouth and nose in the open to keep the moisture outside. It’s condensation that makes the walls of the tent wet when you touch them in the mornings. You don’t want that inside your sleeping bag! There’s nothing worse than getting tucked up for bed and then gradually realizing that all those campfire beers have taken effect… you need another pee. When you're cold you need to go more frequently and there's no use holding it in. Your body has to remain at a steady temperature and, as a result, wastes energy keeping your bladder warm. Pop out of the tent when you get the chance and let nature take its course – you'll sleep much better after. We all like the ease (and the back-ache saving) or big family tents but when it comes to winter camping size matters. Tents are – for obvious reasons – a massive part of the insulation process, so smaller is better. If there are two of you take a small, two-person tent not some eight-man monster. It’ll trap your warmth far better. The same goes for your sleeping bag – if you’re small, buy small. It’ll keep you snug. A little trick that’s a good camping alternative to a water bottle is chucking a few hand warmers inside your sleeping bag just before bed. It works a treat, is something you may well be carrying with you anyway and is ten times easier and more practical than an actual water bottle. Hand warmers can easily be bought in most outdoors and hiking shops. Lithium batteries perform consistently better in cold conditions and also continue working down to a lower temperature than alkaline or NiMh batteries. Not only this but they last longer and weigh less. They’re the perfect batteries for winter camping and now one of the most common types to purchase so you shouldn't have trouble finding them. Layer up by all means; the point is always to stay snug and warm in bed. But don’t wear all the clothes you have, in fact, as much as possible it’s wise to wear less. It’s an old army trick. If you go to bed in full uniform then when you wake up in the morning, unzip the insulated cocoon of your tent and step out into the cold, you'll have nothing to put on to warm you up. It’s going to be a cold start to the day. If you sleep in minimal clothing, however, then when you step out into the cold, you can start to get dressed, layer up and keep warm. A lot of our heat is lost through our head. Folks used to say 50% of your body heat in fact, though this myth has recently been proven to be just that. All the same, it can pay dividends to wear a hat especially if (see number 3.) you sleep with your head outside your sleeping bag. Take some socks specifically for sleeping too, keeping them dry to put on just before you go to bed and, if its particularly cold, consider wearing gloves. If you’re sleeping in conditions that could genuinely be freezing, then plan ahead. Think what will happen to things when they freeze up. Turn your stove fuel and water upside down. Ice forms from the top down, so keeping the opening of your container at the bottom will stop it becoming unusable first thing. Where you can, of course, insulate anything that could freeze.